Wanna know the secret sauce to a great lead generation website and how it feeds into your overall content marketing strategy to deliver leads and ROI? Well, you’re in the right place. For content marketers, strategy is a practical part of their marketing. Strategy for lead generation — content marketing’s primary goal — involves looking at what you want your website to do, rather than what it is. Tomorrow People found that over half of marketers aren’t sure they’ve got it right. Often, you’ll find that a limited number of concrete changes make a big difference to your lead generation figures. In this post, we’ll look at some of them. The overarching theme? When thinking lead generation websites for content marketing, think process not points. Why processes? They get you into the mindset of strategy rather than tactics. Looking over your website, you’ll see many pages that work brilliantly as a single unit. Maybe they communicate one idea well, or scoop up a high percentage of clickthroughs. If you start to think of that single action as one link in a chain of events, it’s a lot more insightful: that well-written idea may be hitting the visitor at the wrong moment, as Hubspot suggests. That high CTR may be wasted because too few visitors are making it to the page. Let’s look at some of those processes… and along the way, the characteristics of a great content marketing and lead generation website. A focus on the visitor’s journey through the website, with clear waypoints and endpoint. Content created to pull in, not be pushed out. A goal of interesting the person rather than selling the product. Engagement of the visitor at the moment he’s most receptive. Increased nurturing of the customer as he or she moves closer to a buying decision. A tactician looks at visitor numbers and page views, in order to discover how he can push them up. A strategist looks at completed customer journeys, and looks for ways to push the proportion of them up. Marketo claims that it is only by looking at the process that you can understand a customer’s real intentions. That’s where a lead generation website strategy starts: Seeing where you’re weak. Of course there’ll be more than one journey. The best lead generation websites provide a pathway for the CEO guiding his company’s strategy, the Financial Director looking for ROI, the Project Owner looking for his next promotion… even the IT guy who has to implement your product. Sometimes they’ll intersect, like crossroads on a road trip, but they are separate journeys. So look at your existing website, and quickly score it out of 10 for the five traits above. Is it journey-based? Encourages pull-in? Caters to interest? Engages at the right moments? Offers warmer nurturing over time? If you totalled more than 25, you’re doing better than most B2B lead generation websites already. Tomorrow People found that 42% of executives admitted to low levels of confidence here. Now you’re in the journey mindset, compare it to a standard sales method: the sales funnel. Each step the customer takes on his journey through your site is (in content marketing terms) one stage of a sales funnel. If most of your visits start on your homepage, that’s stage one: where cold suspects enter your process. You need to get them to stage two: warm prospects. This is the stage where you qualify them, perhaps with content that illustrates a known business pain. Then stage three: hot prospects. These are people genuinely interested in your market who can legitimately be called a lead. How many steps are there in each customer journey? What drop-off rate should you expect between stages? Which stages are exceeding expectation, and which fall short? How many leads each month is each process delivering? 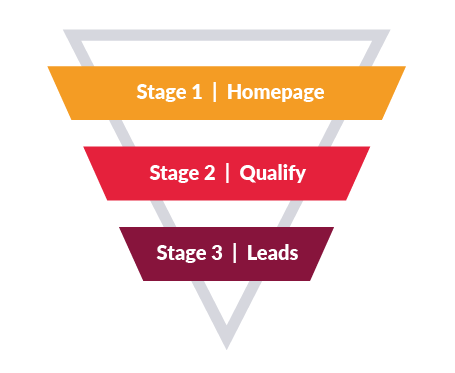 How many leads could it deliver if you optimised the stages before it? How many leads are converting to sales? Adopting the funnel approach shows you where to allocate resources for best effect. If you’re getting a million visitors a month but only two or three sales are popping out of the funnel, there’s probably a huge opportunity to optimise that conversion rate... without having to drive another million people into the top of the funnel. Newsletter backups, providing web versions of email marcomms. Squeeze pages, cordoning off valuable content with a data-harvesting form. Independent reviews, such as Trustpilot who provide social proof. Social media feeds, announcing new pages and content. Knowledge centres, with white papers, eGuides, and other decision support. These connected pathways of content are the basis of marketing automation. So every page needs to know who’s visiting, where they came from, and what they do next. (Simple site analytics aren’t enough). So action 3 in your content marketing strategy is to see how much of your lead generation website content is properly in context with other channels. If a page doesn’t know what stage of the journey a customer is on, it runs the risk of giving them content too early or too late. Great content only becomes great when it’s presented at the right time. So decide: is your lead generation website going it alone, or is it a hub for all channels? Inbound marketing needs the latter. SEO has changed a lot in recent years. Keyword-stuffing, content-spinning, link-farming and metadata-wrangling were all designed to game your way to the top of search results. This, in other words, is a form of cheating. SEO today is much more about fresh, original, compelling content that humans can read, namely with key topics that form part of your content marketing strategy. SEO is a huge part of content marketing: you’re “lying in wait” for people who’ll be pleased to meet you when the right moment arrives. What percentage of your pages are over a year old? Six months? A week? Are your main navigation pages static, or active “teaser tables” for new content within? When people search for you, do they see a lot of content dated over a year ago? Levels of new and repeat visitors alike correlate strongly with how up to date your content is and how often it changes. Blogs. News. Latest papers. Your business sector doesn’t stay static, and nor should your content. To be a thought leader in your market, shift up a gear in publishing your latest thinking. Plan your site as customer journeys rather than clusters of pages. This will encourage prospects and customers to engage, in turn driving leads, revenue and retention. Have a single, consistent content strategy that covers your whole site. As well as looking for a high volume of visitors, also look for relevant visitors. Optimise conversion rates to drive hundreds of content downloads each month. Seek to reduce bounce rates (those who leave after the first page they see) to below 40%. Build high levels of repeat visitors with a turnover of fresh content. Set a goal of 5%+ visitors going on to become marketing qualified leads (MQLs). Remember: for a great strategic lead generation website think process, not points. Calculate your lead generation website ROI now here using our Content Marketing ROI Calulator.